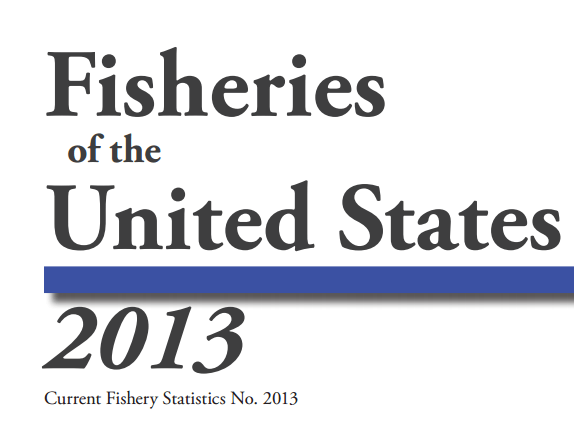 The United States National Marine Fisheries Service just released the 2013 “fisheries of the United States” report. The extremely detailed report contains lots of important information on both recreational and commercial fisheries in U.S. waters, and I recommend giving it a thorough read. I noticed an interesting detail about the U.S. shark fishery, though. In 2013, more large (non-dogfish) sharks were landed by U.S. recreational shark anglers (~4.5 million pounds) than by U.S. commercial shark fishermen (~3 million pounds). This was not the case in 2012. In total, U.S. commercial fishermen landed about 21.5 million pounds of sharks in 2013, including 18.5 million pounds of dogfish. The dogfish fishery is by far the largest U.S. shark fishery by weight of landings, by number of individual sharks killed, and by value and there are some important management concerns about this fishery (smoothhound sharks are dogfish). And while dogfish are sharks, too, this means that approximately 3 million pounds of larger non-dogfish sharks were landed by U.S. commercial fishermen in 2013. Recreational shark anglers, in contrast, landed approximately 4.5 million pounds of non-dogfish sharks in 2013, almost 150% of what was landed by U.S. commercial shark fishermen. Interestingly, this is also almost three times what was landed by recreational shark anglers in 2012, and the third highest reported landings in the last decade. This difference in landings can partially be explained by differences in scale between the fisheries. In 2011, there were 217 “directed shark” commercial fishing permits issued as part of the U.S. Highly Migratory Species management plan for sharks, and this new report notes that 11 million recreational anglers took 71 million fishing trips last year (not just for sharks, overall). An additional table (page 45) notes that approximately 377,000 individual “cartilaginous fish” (including sharks, skates and rays) were landed in 2013, and about 11.5 million cartilaginous fish were released without being landed. Undoubtedly many (though a number impossible to quantify from this report) of these released animals did not survive and suffered post-release mortality. It’s also important to note that the ** next to “other sharks” in this table notes that the species included in “other sharks” for recreational fisheries are different than those included in “other sharks” for commercial fisheries, though that doesn’t really matter for the purpose of my simple analysis here. In terms of overall U.S. ocean conservation policy, this doesn’t mean much. With some important exceptions, the U.S. commercial shark fishery is considered to be relatively well-managed, part of an overall U.S. commercial fishery that has rebuilt 34 previously overfished stocks of fish since the year 2000 with the help of strong science-based fisheries management. This data certainly suggests that dogfish and skates should get more attention from elements of the U.S. conservation community interested in the impacts of U.S. commercial fisheries on marine life, though. It also suggests that recreational angling for sharks, long thought of as minor and insignificant next to commercial fisheries, should be considered more seriously (in U.S. waters, at least). UPDATE: Commercial statistics include landings only, and therefore do not include sharks that were caught as unintentional bycatch and dumped at sea. Many sharks caught as bycatch are landed, though. Interesting observation, David, and a strong argument for accounting for recreational fisheries in the overall picture, The headline is pretty misleading though, given the level of discards and likely discard mortality in commercial vs recreational fisheries impacting sharks. Better accounting for commercial discards of elasmos is also badly needed. There’s plenty of discard mortality in recreational fisheries, too. This data suggests that about 35-30 times as many non-dogfish sharks are released as landed, and many of those likely die. But we can only compare the data we have.